Across Industries, Big Data Is Now the Engine of Digital Innovation..
Enterprises across the globe are confronting the need to create a Digital Strategy. While the term itself may seen intimidating to some, it essentially represents an agile culture built on customer centricity & responsiveness. The only way to attain Digital success is to understand your customers at a micro level while making strategic decisions on your offerings to the market. Big Data has become the catalyst in this massive disruption as it can help business in any vertical solve their need to understand their customers better. It aids this by providing foundational platform for amazing products. We have seen how how exploding data generation across the global has become a clear & present business & IT phenomenon. Data volumes are rapidly expanding across industries. However, while the production of data itself that has increased but it is also driving the need for organizations to derive business value from it. This calls for the collection & curation of data from dynamic, and highly distributed sources such as consumer transactions, B2B interactions, machines such as ATM’s & geo location devices, click streams, social media feeds, server & application log files and multimedia content such as videos etc. It needs to be noted that data volumes here consist of multi-varied formats, differing schemas, transport protocols and velocities. Internet of Things (IoT) has become an entire phenomenon to itself. It is truly a horizontal vertical (no pun intended) as the proliferation of applications of sensors is causing rapid change in system & application architectures. The system of IoT is burgeoning from the initial sensors, digital devices, mechanical automatons to cars, process monitoring systems, browsers, television, traffic cameras etc etc. Big Data is thus crossing the innovation chasm. A vast majority of early adopter projects are finding business success with a strong gain in ROI (Return On Investment). The skills gap is beginning to slowly decrease with Hadoop ecosystem becoming a skill that every modern application developer needs to have. Increasingly customers are leading the way by deploying Big Data in new and previously uncharted areas like cybersecurity leading to massive cross vertical interest. The first element in Digital is the Customer centricity. Customer sentiment analysis by combining internal organizational data, clickstream data, sentiment analysis with structured sales history to provide a clear view into consumer behavior. Product Recommendation engines which provide compelling personal product recommendations by mining realtime consumer sentiment, product affinity information with historical data. Market Basket Analysis, observing consumer purchase history and enriching this data with social media, web activity, and community sentiment regarding past purchase and future buying trends. 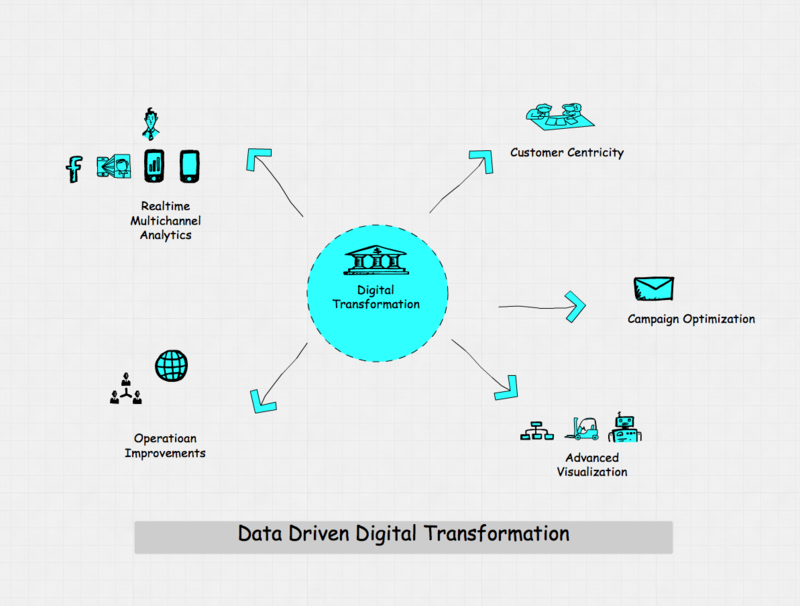 Realtime Multichannel Analytics is the second piece of a Digital Strategy. Mobile applications first begun forcing the need for enterprise to begin supporting multiple channels of interaction with their consumers. For example Banking now requires an ability to engage consumers in a seamless experience across an average of four to five channels – Mobile, eBanking, Call Center, Kiosk etc. The healthcare industry stores patient data across multiple silos – ADT (Admit Discharge Transfer) systems, medication systems, CRM systems etc but all of this must be exposed across different mediums of access. Data Lakes provide an ability to visualize all of the patients data in one place thus improving outcomes. Every customer facing application needs to be both multi-channel as well as one that supports a unified 360 degree customer view across all these engagement points. Applications developed in 2016 and beyond must take a 360 degree based approach to ensuring a continuous client experience across the spectrum of endpoints and the platforms that span them from a Data Visualization standpoint. Every serious business needs to provide a unified view of a customer across tens of product lines and geographies. Big Data not only provides the core foundational elements for a realtime view of the moving parts of the business but also enables businesses to listen to their customers. A strategic approach to improving Risk, Fraud & Compliance analytics can add massive value and competitive differentiation in three distinct categories as shown below. The onset of Digital Architectures in enterprise businesses implies the ability to drive continuous online interactions with global consumers/customers/clients or patients. The goal is not just provide engaging Visualization but also to personalize services clients care about across multiple modes of interaction. Mobile applications first begun forcing the need for enterprise to begin supporting multiple channels of interaction with their consumers. For example Banking now requires an ability to engage consumers in a seamless experience across an average of four to five channels – Mobile, eBanking, Call Center, Kiosk etc. Healthcare is a close second where caregivers expect patient, medication & disease data at their fingertips with a few finger swipes on an iPad app. The ability of outbound Marketing campaigns to reach engaged customers in a proactive manner using the right channel has been a big gap in their effectiveness. The old school strategy of blasting out direct mailers and emails does not work anymore both from a cost as well as a customer engagement standpoint. Nowadays, campaigns for exciting new products & promotions need to be built on the rich customer intelligence assets that Big Data enables you to build. Examples of these capabilities are replete in sectors like Retail where offering a positive purchase experience in terms of personalized offers, price comparisons, social network based sharing of experiences et al drive higher customer engagement & loyalty. My goal for this post was to communicate a business revelation that I have had in past year. While the semantics of business processes, the usecases & the data sources, elements, formats may vary from industry to industry ( e.g. Banking to Healthcare to Manufacturing to Telecom) – the approaches as well as the benefits from leveraging a data & analytics driven business model essentially remain the same. These capabilities are beginning to separate the winners from the rest of the pack.